New York digital agency Code18 Interactive gives America’s oldest apothecary, C.O. 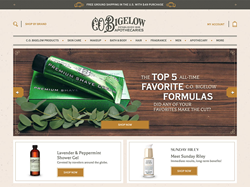 Bigelow, a website redesign that celebrates the legendary Greenwich Village pharmacy and its unique and unusual personal care remedies. The new site is fully responsive and built on the Magento 2 platform. “Shopping at C.O. Bigelow’s retail store in New York City is a unique experience, and we wanted to reflect that authenticity in the online shopping experience,” says Code18 Interactive’s Creative Director Steve Pilon.